Araucariaceae – also known as araucarians – is a very ancient family of coniferous trees. The family achieved its maximum diversity during the Jurassic and Cretaceous periods, when it was distributed almost worldwide. Most of the Araucariaceae in the Northern Hemisphere vanished in the Cretaceous–Paleogene extinction event, and they are now largely confined to the Southern Hemisphere, except for a few species of Agathis in Southeast Asia. Members of Araucariaceae are typically very tall evergreen trees, reaching heights of 60 m (200 ft) or more. 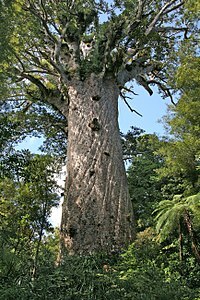 They can also grow very large stem diameters; a New Zealand kauri tree (Agathis australis) named Tāne Mahuta ("The Lord of the Forest") has been measured at 45.2 m (148 ft) tall with a diameter at breast height of 491 cm (16.11 ft). Its total wood volume is calculated to be 516.7 m3 (18,250 cu ft), making it the third-largest conifer after Sequoia and Sequoiadendron (both from the Cupressaceae subfamily Sequoioideae). The trunks are columnar and have relatively large piths with resinous cortices. The branching is usually horizontal and tiered, arising regularly in whorls of three to seven branches or alternating in widely separated pairs. The leaves can be small, needle-like, and curved, or they can be large, broadly ovate, and flattened. They are spirally arranged, persistent, and usually have parallel venation. Like other conifers, they produce cones. Each tree can have both male and female cones (monoecious) or they can have only male or female cones (dioecious). Male cones are among the largest among all conifer cones, on average. They are cylindrical and drooping, somewhat resembling catkins. They are borne singly on the tips of branches or the axils of leaves. They contain numerous sporophylls arranged in whorls or spirals. Each has four to 20 elongated pollen sacs attached to the lower surface at one end. The pollen grains are round and do not possess wings or air sacs. Female cones are also very large. They are spherical to ovoid in shape and borne erect on thick, short shoots at branch tips. The numerous bracts and scales are either fused to each other or separate for half of their lengths. The scales almost always bear only one seed on its upper surface, in contrast to two in true pines (family Pinaceae). They are very large, among the largest seeds among conifers. They are dispersed by wind, usually using wing-like structures. On maturity, the female cones detach and fall to the ground. Due to their size, they can cause serious injuries if they hit a person. The cones of the bunya bunya, Araucaria bidwillii, for example, weigh 10 to 15 lb (4.5 to 6.8 kg), about the size and weight of a large pineapple. They can drop from heights of 23 m (75 ft). Araucariaceae is classified under the order Pinales, class Pinopsida of the division Pinophyta. The division includes all living conifers. Recently however, some authorities treat Araucariaceae as a separate order, Araucariales. Araucariaceae contains three extant genera and about 41 species. Araucaria Jussieu contains 19 living species found in New Caledonia (where 13 species are endemic), Norfolk Island, Australia, New Guinea, Argentina, Chile, and Brazil. Wollemia W.G. Jones, K.D. Hill & J.M. Allen contains only one living species endemic to Australia. It was known only from fossil remains before the discovery of the living species in 1994. Below is the phylogeny of the Pinophyta based on cladistic analysis of molecular data. It shows the position of Araucariaceae within the division. Today, 41 species are known, in three genera: Agathis, Araucaria and Wollemia, distributed largely in the Southern Hemisphere. By far the greatest diversity is in New Caledonia (18 species), with others in Australia, Argentina, New Zealand, Chile, southern Brazil, and Malesia. In Malesia, Agathis extends a short distance into the Northern Hemisphere, reaching 18°N in the Philippines. Several species are very popular ornamental trees in gardens in subtropical regions, and some are also very important timber trees, producing wood of high quality. Several have edible seeds similar to pine nuts, and others produce valuable resin and amber. In the forests where they occur, they are usually dominant trees, often the largest species in the forest; the largest is Araucaria hunsteinii, reported to 89 m tall in New Guinea, with several other species reaching 50–65 m tall. A. heterophylla, the Norfolk Island pine, is a well-known landscaping and house plant from this taxon. Skillful artisans in the Erzurum Province, Turkey, have used fossilized wood of Araucariaceae for centuries to manufacture jewelry and decorative items. It is known as "Oltustone", the name deriving from the town of Oltu, where it is most commonly excavated. Despite the fact that this semiprecious gemstone is classified as “stone”, wood anatomy reveals it was fossilized pieces of trunks of Araucariacea. Oltustone, also called ‘Black Amber’ is unique to Turkey. It is dull and black, but when polished, acquires an attractive black sheen. Fossils widely believed to belong to Araucariaceae include the form genera Araucarites (various), Araucarioxylon (wood), Brachyphyllum (leaves), Araucariacites and Dilwynites (pollen), and Protodammara (cones). In Arizona, the petrified woods of the famous Petrified Forest National Park belong to several species of Araucarioxylon, the most common of them being Araucarioxylon arizonicum. During the Upper (Late) Triassic, the region was moist and mild. The trees washed from where they grew in seasonal flooding and accumulated on sandy delta mudflats, where they were buried by silt and periodically by layers of volcanic ash which mineralized the wood. Some of the segments of trunk represent giant trees that are estimated to have been over 50 m tall when they were alive. The Cerro Cuadrado Petrified Forest of Argentina, also buried by volcanic ash during the Middle Jurassic, are composed primarily of exquisitely preserved cones and wood of Araucaria mirabilis. The occurrence of Araucariaceae in the Dutlu Formation (Late Cretaceous) Erzurum-Turkey, possibly reflects the southernmost record of the family in the northern supercontinent Laurasia, as well as one of the latest examples ever recorded in southern Eurasia. Araucariaceae possibly grew in forests in the coastal areas of Laurasia which was separated by the Tethyan Ocean from the supercontinent Gondwana. Wikimedia Commons has media related to Araucariaceae. ^ Michael Knapp; Ragini Mudaliar; David Havell; Steven J. Wagstaff; Peter J. Lockhart (2007). "The drowning of New Zealand and the problem of Agathis". Systematic Biology. 56 (5): 862–870. doi:10.1080/10635150701636412. PMID 17957581. ^ S. Gilmore; K. D. Hill (1997). "Relationships of the Wollemi Pine (Wollemia nobilis) and a molecular phylogeny of the Araucariaceae". Telopea. 7 (3): 275–290. doi:10.7751/telopea19971020. ^ Poinar, George; Archibald, Bruce; Brown, Alex (1999). "New amber deposit provides evidence of Early Paleogene extinctions, paleoclimates, and past distributions". The Canadian Entomologist. 131 (2): 171–177. doi:10.4039/ent131171-2. ^ a b c d e f g "Araucariaceae". The Gymnosperm Database. Retrieved November 19, 2011. ^ "Araucariaceae: life history and ecology". University of California Museum of Paleontology. Retrieved November 19, 2011. ^ "Agathis australis". The Gymnosperm Database. Retrieved November 19, 2011. ^ a b Fu Liguo; Li Nan; Robert R. Mill (1999). "Araucariaceae" (PDF). Flora of China. 4: 9–10. Archived from the original (PDF) on May 24, 2011. Retrieved 2011-11-19. ^ a b c d James E. Eckenwalder (2009). Conifers of the world: the complete reference. Timber Press. p. 70. ISBN 978-0-88192-974-4. ^ a b c d Stuart Max Walters (1986). The European Garden Flora: Pteridophyta, Gymnospermae, Angiospermae. Cambridge University Press. p. 72. ISBN 978-0-521-24859-4. ^ Gerald Carr. "Araucariaceae". University of Hawaii. Retrieved November 19, 2011. ^ a b Wayne P. Armstrong. "The Araucaria Family: Araucariaceae". Wayne's Word, Paloma College. Retrieved November 19, 2011. ^ a b Kutluk; et al. (2012). "First Report of Araucariaceae wood (Agathoxylon sp.) from the Late Cretaceous of Turkey". IAWA Journal. 33 (3): 319–326. doi:10.1163/22941932-90000097. Cookson, I. C.; Duigan, S. L. (1951). "Tertiary Araucariaceae from South-eastern Australia, with notes on living species". Australian Journal of Scientific Research Series B (Biological Sciences). 4: 415–449. Kendall, Mabel W (1949). "A Jurassic member of the Araucariaceae". Annals of Botany. New Series. 13 (50): 151–161. Kershaw, Peter; Wagstaff, Barbara (2001). "The Southern Conifer Family Araucariaceae: History, Status, and Value for Paleoenvironmental Reconstruction". Annual Review of Ecology and Systematics. 32: 397–414. doi:10.1146/annurev.ecolsys.32.081501.114059. Krasilov, Valentin A (1978). "Araucariaceae as indicators of climate and paleolatitudes". Review of Palaeobotany and Palynology. 26: 113–124. doi:10.1016/0034-6667(78)90008-8. Pye, Matthew G.; Henwood, Murray J.; Gadek, Paul A. (2009). "Differential levels of genetic diversity and divergence among populations of an ancient Australian rainforest conifer, Araucaria cunninghamii". Plant Systematics and Evolution. 277 (3/4): 173–185. doi:10.1007/s00606-008-0120-1. Setoguchi, Hiroaki; et al. (1998). "Phylogenetic relationships within Araucariaceae based on rbcL gene sequences" (PDF). American Journal of Botany. 85 (11): 1507–1516. doi:10.2307/2446478. PMID 21680310. Stockey, Ruth A (1982). "The Araucariaceae: an evolutionary perspective". Review of Palaeobotany and Palynology. 37: 133–154. doi:10.1016/0034-6667(82)90041-0. Stockey, Ruth A (1994). "Mesozoic Araucariaceae: morphology and systematic relationships". Journal of Plant Research. 107 (4): 493–502. doi:10.1007/BF02344070.